In the race to the North Pole, who will become the victor, and who will fall to the ravages of the Cold Beneath? Phillip Syntax is the world's best biomechanic with a checkered past of betrayal and lost love. When given a chance at redemption by the celebrated soldier Gideon Lightbridge, how can he refuse? This ill-fated expedition turns from daring to disastrous when their airship, the Northern Fancy, crashes in the far and frozen north, leaving the crew stranded without hope. But that isn't the worst of it. One by one the dead crew members arise from the cold ashes to seek the warmth of the living, and it becomes every man for himself in an effort not to join the ranks of the revenants. A Chilling Expedition Gone Wrong. What made the experience of listening to The Cold Beneath the most enjoyable? This book was written as a period piece set around 1880. It reminds me of the adventurers who took upon scientific expeditions to undiscovered parts of the planet. In this particular book the adventurers were on an expedition to the North Pole by a helium filled airship. Kind of like Robert Byrd meets Jules Verne, an adventure supported with a sci-fi backbone, and the human element of a man driven to reach this goal. The elements that made this audio book really interesting was first, the style of writing. The protaganist, Phillip, captures the prose and way of speaking from an older style you may expect to have heard from an educated person back in the 1880's. Remember, with no internet back then, writing and expressing yourself well, was considered good form. When you read Jules Verne and Samuel Clemens (Mark Twain) you will pick up on this. The second element was the narration by Chris Barnes. Excellent narration. Chris was interesting in that Phillip's accent and that of the crew was British. Chris also captured a good American accent for Mr. Lightbridge. What was one of the most memorable moments of The Cold Beneath? The part that struck me was when the first person turned dead to undead. Up to this point the story was of an expedition to the North Pole. Then, like a light switch, the story changed and with an omen as what was to come. Lots of good scenes. I would have to say the final scene was my favorite. This is when all the pieces of the puzzle all fall into place. Makes you wonder, who is more dangerous, people or zombies. Well, for me personally, I enjoyed the whole perspective of the trip to the North Pole. I am a boat captain who has worked in the Arctic Ocean, and participated on various oceanographic voyages. So some of what was written was true to life. A number of times I felt in the "moment", and the felt the descriptions of the boat crew and their relationships were true to form. Disclaimer: This audio book was gifted to me by Tonia Brown, after I listened to her audiobook, "Badass Zombie Road Trip". After listening to "Badass Zombie Trip" (a hilarious 10 star zombie comedy), I was really intrigued to listen to some of her other works. I wasn't sure what to expect. This book stands alone as a period piece. For zombie story fans this book is set in a place and time that sets it apart from other zombie novels. As well as the entertaining aspects, it does make you think. It definately has enough twists and turns to keep you guessing. The challenge for the author and narrator is to make the story believable. Tonia Brown has done a good job creating the proper amount of back story with Phillip and the other characters to give them depth, and making them believable. Chris Barnes has the talent to bring these characters alive. At the end of the day, did I like it? Yes, I did. A good read, a good story, and good narration. If you like zombies set in a different time and place as today, get this book! 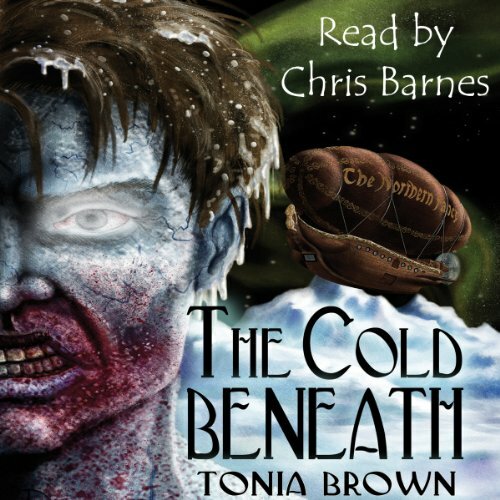 I went into 'The Cold Beneath' knowing absolutely nothing about it, except that Chris Barnes was the narrator, which, of course, was enough to sell me on it rather quickly. The combination of Brown's vivid characters and Barnes's unique talent of bringing those characters to life made this book extremely enjoyable. Lightbridge's death was horrible and I doubt I'll soon forget how it happened. I really missed him when he was gone. Chris Barnes is a Scotsman, yet he read almost the entire book in a British accent, which couldn't have been easy. He brings an intense emotion to each of the characters and some of the voices he performed, I can't tell you which ones without revealing spoilers, were terrifying. 'The Cold Beneath' made me cry during Lightbridge's death. The narrator did such an amazing job conveying the emotion Peter felt at his death, it made me cry. Chris Barnes is a professional through and through. Unlike many narrators, he puts his heart and soul into each book he reads, and his reading is actually more of a performance than a simple narration, Until now, I had not experienced a Tonia Brown book, and after 'The Cold Beneath,' I will certainly check out more of her work. Brilliant characters, a compelling story and quite a few surprises along the way make this book a must-have for horror fans. loved the story gripping from start to finish. This was my 1st Tonia Brown story but defiantly won't be my last.